Holy Family School is so fortunate to have Mrs. Erica Davied, our Occupational Therapist (OT), on our school campus. When asking the primary and elementary students which is their favorite classroom on campus, there is always a resounding cheer for the OT Room. Mrs. Davied’s engaging and enthusiastic demeanor certainly creates a welcoming environment, but the “toys” students get to use when spending time in her room, quickly reinforces why it is a happening place. One visit to the room and you completely understand why students are hooked into playing. Occupational Therapy is an ongoing process of understanding how one uses their body in everyday activities. 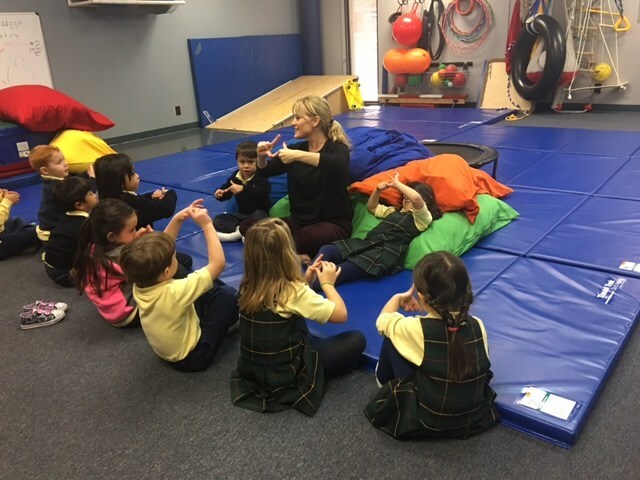 Mrs. Davied works with our Preschool through 2nd grade classes in developing and strengthening their nervous system, which includes sensory awareness, sensory motor, perceptual motor and cognition. In addition, students who have been evaluated for more therapeutic services are afforded the therapy at a reasonable cost to the families. From rolling down the ramp, to jumping on the trampoline, to writing on a table covered in shaving cream, the students LOVE their time with Mrs. Davied. We are so blessed to have her at our school. She is a key contributor within the educational team at Holy Family School.